July | 2009 | Is this thing on? This is the scene from Harbor Park in Norfolk, VA. The Indians and Tides will start up this afternoon at 12:15. RHP Daniel McCutchen (9-6, 4.03) is seeking his 10th win of the season as the Tribe tries to erase the bad taste from last night’s game. Norfolk erased a three run deficit scoring 4 runs over the final three innings culmunating with OF Jeff Fioretino’s game winning single (his 4th hit of the night) in the 9th inning. Just add last night’s game to the long list of frustrating losses during the 2009 season. OF Lastings Milledge was in the Indians original line-up, but has since been removed and as of 11:00 was still a member of the Indianapolis Indians. Perhaps Lastings can smell a call to Pittsburgh because last night he really hustled and played hard. That’s not something he always does, but last night he went 2-4 with a run and stole his 3rd base since joining the team on July 10th. Recently acquired 1B Jeff Clement has not joined the team, but is officially on the roster. He is expected to arrive sometime today and may come off the bench at some time. Last night Brian Bixler made diving catch in center field. I asked him what is better…a back handed play deep in the hole at short or a diving catch in the outfield? After thinking about it for a moment he liked the diving catch better. He thinks he should get balls in the hole and doesn’t feel like you are robbing a guy of a hit, but with the diving catch he took away the possible hit. When Milledge is promoted to Pittsburgh the move will leave the Indians without a true outfielder. The Indians have been using infielders to play the outfield and at times that has been a problem. Give Bixler, Chris Barnwell, Tagg Bozied, and Brian Myrow credit…they are not outfielders and are trying their best. You just have to remind the pitchers they are trying when a ball goes over their head because of a bad route or falls in front of them because of a bad read. The one plus to having the infielders in the outfield is their keen sense of hitting the cut-off man. Both Bixler and Barnwell have strong arms that have led to some assists. What a win for the Indians. McCutchen tosses 7 scoreless innings of three hit baseball to earn his 10th win of the year. 2B Shelby Ford went 5-5 with 2 runs batted in and 3B Neil Walker collected three hits including a pair of two run home runs. The last time Ford had five hits was on June 8, 2008 and the last time Walker had a pair of home runs was…dun, dun, dunnnn…June 8, 2008. Cue the music. Ford did it while playing with Altoona and Neil did it last year at Louisville. The Indians will be making some roster moves tomorrow. RHP Ty Taubenhiem is expected to be removed from the DL tomorrow and start in Ian Snell’s place. Jeff Clement didn’t join the team today, but will likely play 1B tomorrow. Following today’s game OF Lastings Milledge went to the airport and will join the Pirates tomorrow in Pittsburgh. One final note…there are plenty of rumors swirling aournd Indians pitcher Tom Gorzelanny. All I can tell you is as of 4:45 pm he was still a Pirate and not a member of the Chicago Cubs. Tommy was preparing to enjoy a late afternoon dinner with a few of his teammates at the Norfolk Outback Steakhouse. I just finished eating my dinner at Outback and was there when Gorzelanny received the call that he has been traded from the Pirates to the Chicago Cubs. He was with about a dozen or so of his Indians teammates and went around the table shaking their hands and saying his good-byes. He is really excited about joining his home town team and hopefully he will have a chance to pitch in October. I don’t know much about the players that are coming to the Pirates, but a few of the current Indians have faced them at Triple-A Iowa and tell me the two pitchers are legit. RHP Jose Ascanio will be joining the Indians and may become a starter. Don’t hold me to that, but from what I was told he will be tried as a starter. “I wonder if Ian will pitch for us on Friday?” Indians pitching coach Ray Searage to hitting coach Jeff Branson during Tuesday’s game at Norfolk. I am currently sitting in the lobby of the Sheraton Norfolk Waterside Hotel and several players are walking by asking about the Pirates most recent deal. (on a side note…I sat in this lobby yesterday for 2 and a half hours because my room was not ready. The team arrived at 12:45 and by 3:15 I was still without a room and had to go to the park. So I didn’t check into my room until 11:00 pm, very aggravating) Less than an hour ago the Pirates shipped SS Jack Wilson and RHP Ian Snell to the Seattle Mariners for SS Ronny Cedeno, Triple-A 1B Jeff Clement, RHP Aaron Pribanic, RHP Brett Lorin, and RHP Nathan Adcock. I’m on my way to the ballpark and from there I’ve have more of a blog update for you. All I can tell you at this time in Jeff Clement is expected to join us after hitting .288 with 14 home runs and 68 runs batted in for Triple-A Tacoma. Clement has split time as a catcher, first baseman, and DH. Ray Searage just checked out the three pitchers stats and what he noticed was their height. Pribanic played college ball at Nebraska and the 23 year old is listed at 6’4″. Lorin is only 22 and is listed at 6’7″ and Adcock is a 21 year old listed at 6’5″. RHP Steven Jackson played in the Arizona Fall League with Clement and tells me Clement can hit. C Erik Kratz says you’ve got to like a power hitting lefty who can catch. Clement will join the Indians tomorrow and we’ll see if he catches or plays first base. Sixty mph winds have hit the Norfolk area. The heavy rain is expected to throughout the six o’clock hour and we will have to see if the field will be playable for tonight’s game. Notice in the picture the distorted part of the picture. A split second after I snapped the picture a bolt of lightning appeared to hit the stadium followed by an incredibly loud crash of thunder. Shorty after I retreated back into the clubhouse. The clubhouse is buzzing because of the Pirates/Mariners deal. Ian Snell was offered plenty of good luck and a few congratulations from his Indians teammates. Snell was asleep when the trade went down and woke up to take Bucs GM Neal Huntington’s phone call. Ian admitted all he really heard was the word “trade” and from there was overcome with excitement. He knows SS Jack Wilson is the main name in the trade and he is just fine with that. Ian is better suited to be in the background and is expected to join the Mariners rotation. He wants to pitch on Saturday, but my guess is the Mariners would like him to pitch sooner. In this picture Snell is watching SportsCenter as they broke the news of Cleveland LHP Cliff Lee going to Philadelphia for a group of minor league prospects. I told Ian the Phils/Indians deal pushes the Pirates deal to page two and he was more than fine with that. Snell did talk to Jack who is excited for the move to Seattle and Ian told me he had over 50 texts and 20 voicemails within 30 minutes of the deal. According to Snell the Mariners have expressed interest in the past and was excited after talking to their GM Jack Jduriencik. Indians hitting coach Jeff Branson was a deadline deal back in 1997. Branson was dealt on July 31, 1997 along with John Smiley from Cincinnati to the Cleveland Indians for four players. At the time Branson was playing for the Indianapolis Indians and was excited by the trade because he joined the Cleveland Indians and a pennant race. He told me it’s hard to play when you hear rumors about potential trades. He said the year before (1996) he was rumored to be a part of a deal and that’s all he could think about. In the end he wasn’t dealt and learned that most rumors don’t pan out. Ray Searage was not apart of a deadline trade, but was traded by Milwaukee to the White Sox on July 23, 1986. Ray said the trade caught him off guard, but it rejuvenated him. Ray was 0-1 with a 6.95 ERA in 17 games with the Brewers and after the trade went 1-0 with a 0.62 ERA in 29 games with the Sox. Yeah, I’d say the trade rejuvenated him. The Indianapolis Indians have dropped two straight games after winning four of their first five on their current 8-game homestand. This afternoon 24 year old year old RHP Tobi Stoner limited the Tribe to a run over 8 innings giving the Buffalo Bisons two straight wins. Stoner out pitched Indians righty Ian Snell who was lifted for a pinch hitter in the bottom of the fifth after surrendering two runs on 9 hits in five innings of work. Snell threw 81 pitches and 58 were for strikes. As has been the case, several scouts were in attendance to see Snell who was hit harder this afternoon than in any of his previous five starts. We can only imagine what is going on in the mind of the 27 year old. He is not pitching for a promotion, but rather he is pitching for the opportunity to join another Major League team. Has he done enough to catch the eye of another team and are they willing to give the Pirates what they desire? The rumor mill will be working overtime with the trading deadline less than a week away. This is a picture of Snell signing autographs prior to Saturday night’s game. The Pirates jersey’s the Indians wore on Saturday will be auctioned online beginning next week. The proceeds will go to Pittsburgh Pirates and Indians charities. Saturday’s autograph session brought all the players out onto the Victory Field concourse. The players signed everything from baseball cards to hats to t-shirts. OF Lastings Milledge and RHP Brad Lincoln shared a table. Take a look at the line of fans waiting for an autograph. A little more than an hour after this picture was taken Lastings was ejected by home plate umpire Lance Barrett. He was called out on a check swing and was given the thumb after throwing his bat and helmet down near home plate. I didn’t get a chance to talk to him after the game, but Lastings was in the line up today and skipper Frank Kremblas said he needs to know better than to put himself in that situation. With NFL training camps set to open up LHP Tom Gorzelanny is talking fantasy football and plans on taking all Chicago Bears. (knock yourself out Tommy) He keeps making fun of Brian Bixler and I because we are the only Cleveland Browns fans on the team. Gorzo thinks Bix and I are are going to draft a Browns QB. Bix and I are fairly confident Brady Quinn and Derek Anderson will be around in the late rounds and if not someone is a sucker. Gorzelanny and Bixler shared a table last night and it was one of the most popular tables. Tom starts tomorrow night vs. Buffalo. In his last 10 starts Gorzo is 3-3 with a 1.54 earned run average. Over that stretch (May 2-current) he has 59 strikeouts in 58.1 innings while walking only 18 batters. How about this one? I’m not sure where these rumor started or if diehard Cubs fan Bill Potter was dreaming and talking while working in the Indians press box, but people were saying the Cubs are interested in trading with the Pirates. The names mentioned were LHP John Grabow, LHP Zach Duke, and/or Gorzelanny. Don’t look to deep into the rumors because the one thing you can count on is if it’s a rumor than it’s not happening. It always seems like the deal you least expect (Adam LaRoche to Boston) happens and the deals rumored always fall through. One bright spot in today’s game was Brian Bixler. He led off the Indians half of the first with an opposite field home run. The home run gives him a career best six homers in a single month. Too bad it was the only run the Indians would muster against Buffalo. Bixler is hitting .319 this month with 6 home runs and 15 runs batted in. Pretty good numbers for Bix, but he’s got nothing on the Legend. **Special Thanks to Diana Biette the Indians Marketing Coordinator/Designer for taking the pictures in this entry. As of 11:00 this morning everything was quiet at Victory Field. Of course that can change over the next few hours and as we learned again yesterday things never stay the same for the Pirates Triple-A affiliate. Wednesday morning the Pittsburgh Pirates shipped 1B Adam LaRoche to the Boston Red Sox for a pair of minor league players. One of those players will be joining the Tribe. I’m expecting SS Agenis Diaz to make his Indians debut as soon as tonight. Diaz is added to the roster thanks to 1B Steve Pearce rejoining the Pirates. You can click here, here, here, and of course here if you want to learn more about the trade. If you are interested in Agenis Diaz I would recommend a look here. This will be the second time Pearce has been called up to Pittsburgh and it appears he will become their everyday first baseman. I spoke with him briefly yesterday and his excitement was tempered only because he’s heard before that he will get opportunities and at-bats. I do believe this will be different and I hope he gets to play everyday. If he falls into a slump, I hope the Pirates will continue to let him play like they have done with OF Brandon Moss and 3B Andy LaRoche. If the Pirates give Pearce an extended look he will eventually deliver. I don’t even want to entertain the possibility of him struggling and then sitting bench,…it could ruin him. For now OF Lastings Milledge stays and he didn’t expect a call-up. I find it interesting Lastings feels like he belongs in Triple-A. He says for most of his career he has felt rushed to either Triple-A or the big leagues. He knows better than anyone if he was rushed at the age of 21 to the New York Mets. The numbers tell you that he has the physical tools to succeed and now he appears to be working on the mental tools. I believe his defense is the only part of his game that isn’t Major League ready. Everything else appears to be there including his demeanor. Since Milledge arrived on July 10th he has been hit with several media requests and I was amazed at how cool he was leaning against the batting cage on Tuesday afternoon with a camera lens less than two feet from his face. The camera man was taking pictures of him during BP and Lastings never budge and looked ahead as if the camera was never there. There is now way I could do that, but he says it’s been like that for a while and after time you get used to it. Milledge (played with the NY Mets ’06-’07) was told he will not have to worry about Page Six stalking him in Pittsburgh. Pirates players fly under the radar in Pittsburgh unless of course they are out with a Steelers player. The forecast looks good for tonights game between Indains RHP Brad Lincoln (1-1, 5.75) and Durham RHP Andy Sonnanstine (2-0, 3.46). First pitch is at 7:00 with pre-game coverage at 6:40. Freshly acquired Argenis Diaz will bat 9th tonight for the Tribe and play at short. This will be his Triple-A and Indians debut. I have not met Argenis, but his name is on the card. It was just one win, but the Tribe beat Durham last night in front of 13,862 fans…the largest non-July 4th Monday crowd in the history of the Indianapolis Indians. The Indians have now won four out of their last five and will send Ian Snell to the mound tonight followed by Tom Gorzelanny on Wednesday afternoon. It was only one game of this eight game homestand, but the crowd and effort by the Indians may be a sign of better times ahead. 1B Steve Pearce hit a 425 foot home run to left in the 4th inning to give RHP Daniel McCutchen and the Tribe a 2-0 lead. An inning later CF Brian Bixler launched a nearly identical 415 foot home run to push the lead to three. That was plenty for McCutchen who improved to 9-5 and won his fifth consecutive start. McCutchen kept the Bulls off balance by throwing his change-up for strike one and then using his 91-92 miles per hour fastball. It was one of his best efforts of the season and he shut down a Durham team that came into the game 2nd in runs scored and tops in the league with 98 home runs. RHP Chris Bootcheck need only 11 pitches to nail down his first save since June 29. Bootcheck has converted 11 straight saves and is now 4th in the league with 15. What makes “Booter’s” save so important is it was only his third appearance this month. The player of the month for June was away from the club for family reasons and his return to the back end of the ‘pen solidifies the club. The plane howls with laughter as the flight attendant says we should expect a bumpy ride. It turned out to be a nice relaxing 40 minute flight and when we departed the pilot thanked us for making his day a memorable one. Ian Snell (2-1, 0.34) will make the start tonight and I wonder if it’s his last with the Pirates. The MLB trading deadline is July 31st and each of the past three seasons the Bucs have made a move at the deadline that has directly effected the Indians. Snell will face the Durham Bulls and left-hander Jason Cromer (3-2, 1.78) tonight at 7:00. The Indians won for the 5th time in their last six games tonight by beating Durham 2-1. RF Brian Myrow was the hero going 3-4 with two runs batted in. He drove home the game winner with a two out base hit through the right side of the infield. RHP Ian Snell didn’t figure in the decision, but he did have something to do with the outcome. That is Myrow letting his kids down on the field and after Snell nailed him with the shaving cream. Tonight Snell pitched 6 inning allowing one run on three hits. His ERA actually went up from 0.35 to 0.56 and he struck out 9 more batters. He has struck out 43 in 32.1 innings of work. Tomorrow at 1:00 LHP Tom Gorzelanny squares off against Durham righty Wade Davis. The Indians are 5-1 since the All-Star break. I would rather being enjoying some dinner right now, but I was able to connect to the hotel wireless for the first time since we arrived on Thursday…Sooooo, it’s time to blog. This afternoon the Tribe was one out away from becoming the 10th team no hit by the Pawtucket Red Sox. Baseball is a crazy game. The Indians won the first three games of the series by outscoring the Paw Sox 24-15 and pounding out 41 hits. The Tribe was as dominating in those games then at any point this season. They always say you are only as good as today’s starting pitchers and this afternoon the crowd was treated to a show. Paw Sox starter Michael Bowden (5IP, 4BB, 5K) lived up to his #2 prospect label and Indians righty Eric Hacker (7IP, ER, 6H, 6K) pitched his best game since joining the team in mid-May. Bowden was lifted after the 5th (pitch count) removing the normal suspense you have from a potential no-hitter. The crowd started to get behind the Paw Sox pitchers in the 7th inning when LHP Javy Lopez set down the Indians in order and the reality that the Tribe would suffer a no-hitter really hit home when he did the same in the 8th inning. After the Indians batted in the top of the 8th inning I made my way down to the field for the post game interview and made a point to watch the crowd. They were really buzzing while in the bullpen the Paw Sox All-Star closer was warming up. Lopez started the 9th inning and retired Brian Myrow…one out. Ron Johnson then summoned Fernando Cabrera from the ‘pen and he promptly got Steve Pearce to fly out to right field…two outs. So, it was up to Larry Broadway and 8,172 fans all wanting him to fail. Cabrera missed on the first pitch and on the next offering Broadway hit a groundball up the middle just past the Pawtucket SS for the Indians first hit. The crowd was bummed, but quickly put together a nice ovation, but the real celebration was in the Indians dugout. Every player jumped up and started to clap with a few exchanging high fives. Things got interesting when Tagg Bozied hit a two run home run, but that would be all the Indians would muster losing this afternoon 3-2. This was an exciting series and we’ll see if the Indians continue their hitting tomorrow night when they begin an 8 game homestand. It was almost another historic game at McCoy Stadium. This is the oldest stadium in the IL and was renovated in 1998. This is a picture from the walkway along the third base line. The unique feature of McCoy is the dugouts are embedded into the wall underneath the grandstands. Over the decades the fans in the area have fished for autographs. The kids will put baseballs and Sharpie’s in a bucket and when the players walk by they will sign the ball and drop it in the bucket for the next guy. The Indians have a few buckets hanging into their dugout along with a few baseball card books and each player signed his card and they always signed the balls. I have always enjoyed this park because of the crowds and all the history here. The most famous game in McCoy Stadium history started back on April 18, 1981 and 33 innings later was completed on June 23. For 20 innings the Red Sox and Rochester Red Wings played to a 1-1 tie until Rochester took a 2-1 lead in the top of the 21st. The Paw Sox tied it in the bottom of the 21st and they would play on until 4:07 am. The game was suspended after 32 innings. Nineteen fans remained in the stands when the game was called after 4 am and every one of them received lifetime passes to McCoy Stadium. When the game resumed in June it took all of 18 minutes to complete when the Sox scored in the bottom of the 33rd inning. The great note from the game is two future Hall of Fame players started the game. 3B Wade Boggs was playing for Pawtucket and Cal Ripken Jr. was playing for Rochester. It’s the longest game in professional baseball history. Today Pawtucket was one out away from their 10th no-no and first since Bronson Arroyo tossed a perfect game vs. Buffalo back on August 10 of 2003. I’m glad it didn’t happen. One final quick note, I spent a few minutes with former Pirates GM Dave Littlefield on Saturday night. He has been working the past two seasons with the Chicago Cubs and works the Northeast. RHP Brad Lincoln was starting for the Indians and back in 2006 he was selected by Littlefield with the Pirates first round pick. I asked him if he was responsible for Lincoln and he smiled telling me “not since I got fired.” He is doing fine and still lives in the Pittsburgh area. The Indians are flying home tomorrow and if I don’t see you at Victory Field, tune in for first pitch at 7:00. Here are some numbers from last night’s game between Pawtucket and the Tribe. OF Lastings Milledge reached base 5 consecutive at bats and has reached base safely in 9 of his 11 plate appearances against Pawtucket. It all added up to an Indians 7-3 win and LHP Tom Gorzelanny earned the win allowing 1 run in 6 innings of work. Since Gorzelanny was optioned from Pittsburgh to Indy on June 10th he is 3-2 with a 1.12 ERA. The 26 year old has giving up only 4 earned runs in 32.2 innings of work while striking out 34. An Indians win tonight will match their longest road winning streak of the season at 3 games. Since joining the Indians on July 10th Milledge is 9-19 with only one strikeout. His right hande is feeling better by the day and he is working hard with Bar (Tribe strength coach) on getting back into shape. Lastings admits his weakness is defense, but he is working overtime during batting practice and each day he arrives early to improve his foot work. The 24 year old is on his third organization and deserved or not has a reputation for being cocky. After spending the past week with him, I can tell you that he is cocky when he is between the lines. Personally, I think Lastings and Nyjer Morgan (traded for each other on June 30) tend to rub teammates and opponents the wrong with their antics, but Nyjer’s upbeat personality tends to overshadow his behavior. When Lastings is issued a walk (so far 4 times) he drops the bat at home and trots to first. He is not the first or the last baseball player to do that, but it can rub guys the wrong way. When a routine fly ball is heading his way, Lastings will slap his thigh with the glove then make a one handed catch. Again, nothing major, but it just adds to his reputation. He has yet to hit a home run, but I’m sure fans and players will find something wrong with his trot around the bases. The one things you can’t say is he is dogging it. Milledge is playing hard and his talents have opened my eyes. After one week he appears Major League ready at the plate and is growing as an outfielder. He is not taking anything for granted and is not assuming that he is heading to Pittsburgh. Here is a You Tube clip of Indians 1B/OF Tagg Bozied doing the starting line-ups prior to an ABQ Isotops game last summer. You have to check it out and it really picks up when he introduces the home team. He said he couldn’t do this for the Indians because he needs time to figure out his teammates personalities. When he figures that out and has nicknames ready…this should be done at Victory Field. Garrett Jones is becoming a folk hero in Pittsburgh. The Bucs OF blasted two home runs yesterday, including the game winning off Bobby Howry in the 14th inning. After hitting .307 with 12 home runs and 49 runs batted this season for the Tribe, Jones has exploded for the Pirates. His contract was purchased by the Bucs on June 30th and is hitting .313 with 7 bombs and 9 ribbies in just 12 games. He is already 3rd on the team with 7 homers (1B Adam LaRoche 12, former OF Nate McClouth 9) and has gone deep in four straight games. About a dozen or so guys watched the end of last night’s game in the clubhouse and they erupted when Jones connected for the game winner. C Erik Kratz joked that it would have been a double at Victory Field and a few guys felt he should have posed a little longer after the swing. Keep it up Jonesy and maybe he can have the type of late 20’s success that longtime Minor Leaguer Ryan Ludwick is enjoying in St. Louis. RHP Ian Snell is still with the Indians and we’ll see if that is still the case on July 31st. This headline had the Pawtucket press box believing Snell was not going to make his scheduled start. Upon further reading it’s a hopeful fan wanting the services of Snell. I told him about the story and his reaction was priceless. He inquired about any other rumors and I didn’t get the same reaction as before when I told him no. Here is the Indians roster move for tonight’s game. RHP Brad Lincoln is back with the team an will make his 4th Triple-A start. Lincoln has in 0-1 with a 7.69 ERA since his Indians debut on June 24. To make room for Lincoln the Indians have placed RHP Ty Taubenheim on the disabled list. RHP Jeremy Powell moves from the stating rotation back to the pen to help with the loss of Tauby. The sun is shinning and it’s time to go check out some batting practice. We’ll see if the Indians keep their hitting shoes on. The Tribe has outscored the Paw Sox 16-8 out hitting them 27 to 16. The Indianapolis Indians shelled the Pawtucket Red Sox last night to win their first game back from the All-Star break. Everyone in the line-up had a hit by the end of the 4th inning and 8 of the 9 batters collected at least one RBI. The offense grabbed the headlines, but once again RHP Ian Snell continued to prove that he is just too good to be in Triple-A. The 27 year-old made his fourth start for the Tribe and lowered his ERA from 0.45 to 0.34. Here is Ian’s four game total to give you an idea about how dominate he has been…26.1 IP, 16 hits, 4 runs, 1 earned run, 8 walks (5 last night), and 34 strikeouts. Snell was never in any trouble last night until he started to show some signs of frustration in the 7th inning. After striking out Dusty Brown (who left after the at bat to be with his expecting wife) Snell walked Bubba Bell and then drilled Jeff Natale. The Natale at-bat was where it appeared the wheels started to come off. Snell missed high and tight to the righty for ball one and the very next pitch was in the same location and he drilled the Paw Sox first baseman in the left shoulder. Natale was less than pleased and C Robinzon Diaz went out to calm down Snell. It didn’t work, Snell walked the next batter to load up the bases and RHP Mike “Houdini” Koplove was called in from the bullpen. Snell was cruising last night, but just lost his control in the 7th and was in danger of not getting the win. That’s when Koplove entered the game and induced Angel Chavez into a bases loaded inning ending 6-4-3 double play. Since joining the Indians on June 5th, Koplove has inherited 14 runners and only 1 has scored. Nine of the 14 runners have been in scoring position inheriting 7 with less than two outs. It was another middle inning save for the 32 year old righty. Thursday started bright and early with the team bus departing from Victory Field at 6 am. The talk on the bus was C Erik Kratz taking home the Triple-A All-Star MVP. Kratzy went 2-2 with the game winning home run to take home the honors. What a thrill for him in his first ever All-Star appearance and he told me that it was an unbelievable time. Kratz told me the city of Portland did everything right and it was an experience he’ll never forget. That was the scene yesterday in the Indians clubhouse at McCoy Stadium. Kratz’s flight didn’t arrive until after 6:00 and that gave the club plenty of time to prepare for Sir Kratz’s arrival. The tape wrapped around the clubhouse until it arrived at his locker. When Erik finally arrived at the park his teammates formed a tunnel of bats for him to walk through where at the end RHP Jason Davis was waiting for him in catching gear. Even after his cross country flight, Kratz was beaming with pride after his showing at the All-Star game. This next bit of information involves a former Indianapolis Indians player. 1B/OF Adam Boeve has spent this season at the Pirates Spring Training facility recovering from Vertigo. Boeve missed the final weeks of the ’08 season due to dizzyness and after several months of rest and rehab was ready to return to the diamond. Unfortunately, there was no place for him with the Pirates and he was released this past weekend. Boeve is hoping to find a job in the Independent League or catch on with another Minor League club. 3B Neil Walker was activated off the DL yesterday and is a little sore today. He is coming back from a sprained PCL in is left knee. Sad to say the repairs didn’t increase his speed any, but the down time did give him a chance to follow the Penguins march to the Stanley Cup. He was quick to remind me that his hometown has two championships and my hometown (Cleveland) has not had one in my lifetime. So, I politely smiled and bit my tongue because playing for the Pirates is just too easy of a target. Walker is in the line-up once again today and will take an occasional day off to rest his knee. Teammates are describing 1B Steve Pearce as someone who is on a mission. To where, I don’t know, but Pearce is 8 for his last 17 with 8 runs batted in and 7 of his 8 hits have been for extra-base hits. His batting average is currently .286, two points shy of his season best of .288 back on May 17th. LHP Tom Gorzelanny gets the start tonight for the Indians. What with the Pirates do if he continues to dominate hitters? Tom is 1-2 in his last three starts, but has given up one earned run in 18.2 innings while striking out 19. This will be Tom’s 13th start with the Indians where he is 3-3 with a 2.77 earned run average. Believe me it’s an absolute joy to watch Ian Snell and Gorzelanny pitch, but with each start you begin to wonder why they are here and if their next Major League will be with the Pirates or a team to be name later. A view from the radio booth during last night’s game. I love the “Paw Sox” in the dirt behind home plate. The Indians split tonight’s double header with the Toledo Mud Hens. 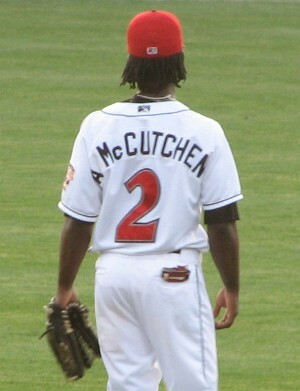 The Tribe offense backed up game one winner Daniel McCutchen (8-5) by hitting two early home runs to beat the Hens 7-3. The Mud Hens flipped the script getting to Ty Taubenheim (4-8) and Steven Jackson (IP, 3ER) to win 7-2. 1B Steve Pearce continues to impress going 3-4 with 3 doubles and 3 runs batted in. Pearce walked three times in tonight’s DH and is 4-12 in his return to the Indians line up with only three strikeouts. I expected Pearce to struggle because he lacked at bats during his three week stay with the Pirates, but he has not missed a beat and is a boost to the offense. OF/1B Brian Myrow and All-Star C Erik Kratz each homered in game one while C Hector Gimenez went deep in the nightcap. There was a lot to be pleased with tonight and the Indians will shoot for the split in this four game series tomorrow night. OF Lastings Milledge showed off all of his tools in the twin bill. The 24 year old went 2-5 in the DH scoring two runs, stealing 2nd base, and throwing out a runner at home plate. The first thing that surprises you about Lastings is his size. He is 5’10 or 5’11 and has a thick build. He is built more like a free safety than an outfielder. Each one of his new teammates have told me they didn’t know he was that big and strong. In game one Lastings laid down a push bunt for a sacrifice that he almost beat it out for an infield hit. The sac set up the Indians third run of the game. He singled up the middle in each of his next two plate appearances. After the second hit Milledge stole second base getting a great jump forcing Toledo C Max St. Pierre to rush his throw into centerfield and Milledge advanced to third. It feels good and I’m trying to get my timing back and see pitches. It’s good to get a couple of hits and get things going. In game two Milledge would show off his defensive skills by making several nice running catches in the outfield and throwing out Brent Clevlen at home plate. In the 2nd inning 2B Will Rhymes (how is he not a rapper?) hit a fly ball to medium left and Milledge let it fly nailing Clevlen with a few feet to spare. I’ve been trying to work on my defense and trying to get some work in on the transition to left. I put in some overtime in left with Princey (GCL Pirates Manager Tom Prince) trying to really, really focus on my defense because it’s big up in Pittsburgh. So if I ever get a chance to play in left field I want to be able to take advantage of it. In the first inning of game one Milledge was thrown out at the plate trying to score from first on a double by Pearce. Toledo CF Don Kelly (yes…that Don Kelly) hit SS Brent Dlugach at the cut off who threw a strike to home that caught Milledge off guard. He told me he didn’t think they would get him and he failed to knock the ball from the catcher during the collision. Overall tonight there was a lot to like about Lastings Milledge. The Tribe will have some reinforcements arriving after the All-Star break. The team is not only expecting 3B Neil Walker to return from the DL, but C Robinzon Diaz will join the club after the break. Diaz was optioned to Indy from Pittsburgh yesterday and will take his full 72 hours to give him 6 days off. On Friday Detroit Tigers lefty Dontrelle Willis threw a simulated game. The D-Train has been on the DL since the end of May dealing with anxiety disorder. He threw four innings or so and the good news is he appeared to be in good spirits. There have been way too many players struggling with anxiety and depression. This is not an easy business especially when you can’t throw strikes. Add Lastings to the list of unusual names on the Indians squad. I have not asked him about his first name, but can tell you the story behind two other players. RHP Ty Taubenheim likes to tell people his name is short for Tyrone, but sadly that’s not the case. Due to his long last name his parents wanted to keep his first name short. So they decided on Ty. Ty didn’t do his son the same favor naming him Charlie. UTIL Robert Bozied has been going by the name Tagg ever since he can remember. Tagg’s grandpa was once nicknamed Tiger and through the years it was shortened to Tig (like tide). From there, Tig turned into Tagg and that turned into the middle name for Bozied. So Robert Tagg Bozied has always gone by his middle name in honor of his grandpa. Just thought you would like to know. Can you play the outfield? 1B/OF Steve Pearce and RHP Steven Jackson are with the Indians one day after being optioned from Pittsburgh. Jackson will not be activated today, but Pearce is and will be batting 4th this afternoon. Pearce was candid about the demotion and told me today that he has no idea what he is doing at the plate. Sitting for the past three weeks will do that to a hitter. Ryan Doumit continues his rehab assignment this afternoon and will likely be with the team over the weekend. Doumit has yet to catch a full nine inning game and from what I understand he will not be activated until that happens. I was a little surprised to see that Doumit is catching today (thought he would DH) after catching 7 innings last night. We’ll see if he makes it through the full nine. Brian Myrow will be playing in RF today and was told a few days ago that he would be making that move. Add him to the long list of infielders moving to the OF. This creates a spot for Pearce at 1B and allows Frank Kremblas to keep Myrow’s bat in the lineup. The only true outfielder on the roster is Jonel Pacheco and he will be in CF today. In the coming and going department, UTIL Luis Cruz packed his bags last night and will be recalled by the Pirates tomorrow. Cruz was on the Pirates opening day roster before he was sent to Indy on April 21. Cruz is likely to ride the pine and pinch hit for the Bucs. I’m expecting to see Lastings Milledge tomorrow in an Indians uniform. The 24 year old OF is currently in Florida rehabbing from a broken hand he suffered agains the Indians back on May 11. He was playing for Syracuse and fouled a ball off his hand while trying to bunt against Ty “the hitman” Taubenheim. Hopefully the dreadlocked one has the same impact our previous dreadlocked centerfielder. Finally, 3B Neil Walker is progressing from his knee injury and will be with the Tribe after the All-Star break. The Indians ’08 MVP has been on the DL since June 10th and last played for the Tribe on June 2. We are in Toledo and the Hens are finishing up their series with Louisville. My room has a view of Fifth Third Field, but the sun is too bright to open the blinds. The Indians were blasted this afternoon by Columbus. The Clippers roughed up the Tribe 9-0 making that the 11th time in the past 17 games the Indians failed to score more than three runs. After the game Ryan Doumit met with Bucs GM Neal Huntington and it was decided that his rehab assignment is finished. Doumit didn’t make the trip to Toledo and my best guess is he will be joining the Pirates tomorrow in Philly. I’m a little surprised his rehab stint is up, but personally I think it’s for the better. He didn’t want to be here and it was obvious to see by his demeanor and at bats. I think this helps the Indians by putting Erik Kratz back behind the plate for Ian Snell. Check out this story about Pirates reliever Joel Hanrahan earning a win today from his hotel room. Today the Nationals and Astros finished up a suspended game and Hanrahan was the pitcher of record at the time of the suspension. He earned the win when…ready for this…Nyjer Morgan scored the winning run. Morgan was sent to the Nats when Pittsburgh traded for Lastings Milledge and Hanrahan on June 30th. Kinda neat.